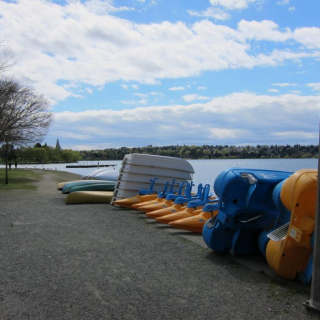 Seattle’s popular Green Lake neighborhood may not have the panoramic views of the Puget Sound and Olympic Mountains that Magnolia and Ballard have, but as the name suggests, it does have something enviable that draws buyers here from all over Seattle — a lake. And a lake for the people and their four-legged friends at that! Instead of private homes built on its shores, the lake is surrounded by a popular public park with grassy slopes, a 2.8 paved trail, tennis courts, running track, pitch n’ putt course, theater, boats, soccer fields and baseball diamonds. Year round, rain or shine, the lake is shared by joggers, skaters, bicyclists, walkers, strollers and dogs. What’s the real estate like here? Premium. Green Lake homes are highly sought after, particularly when they have a view of the water. Green Lake, like much of North Seattle, is dominated by older single family homes including Bungalows, Colonials and Tudors. The closer you are to the lake, the higher the price of the home. An increasing numbers of condo and townhome developments have made this a more affordable neighborhood for those desiring to be by the lake and the many amenities including cafes, restaurants, eateries, spas, boutiques and shops that border the park. Geographically, Green Lake is bordered by Phinney Ridge and Greenwood to the west, Fremont and Wallingford to the south, Ravenna to the east and Northgate to the north. As of March 6th, 2013, the least expensive property for sale in Green Lake is a studio condominium priced at $225,000 while the most expensive active single family home is a 4 bedroom, 3.5 bath Northwest Contemporary offered for $1,125,000. Looking at the last 90 days, the Median List Price in Green Lake is $544,000.